Top 5 Fridays! 5 Amazing Deals We Have for Black Fri-Cyber Monday Weekend! Huge Holiday sale going on now! I am so thankful for your support! Here are 5 amazing deals you can get on our seminars, products, and subscriptions! To give thanks, we're having a HUGE sale on the following - click to save, if coupon, will be auto applied at checkout! 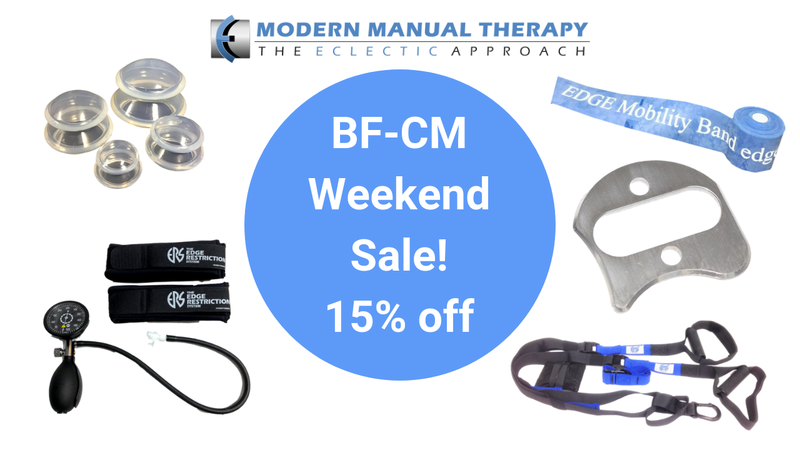 this includes The EDGE Mobility Tool, EDGE Restriction System BFR Cuffs, Modern Strength Training Online BFR Certification Seminar/training, EDGE Suspension Trainer and more! Click the link to have the coupon auto applied at checkout! Want to learn IASTM, Cupping, and Compression Wrapping from both myself and Dr. Mike Reinold? 4) $200 off MMT Seminars! Learn IASTM, Neurodynamics, Clinical Practice Patterns and the Eval, Reset and Stabilize System! Limited spots only at this $200 off price, good until Cyber Monday midnight EST, Nov 26th, hope to see you there! 5) $20 off yearly subscription to Modern Manual Therapy Premium! with exclusive live cases, Clinical Practice Patterns, an online forum and bi-monthly research reviews, there has never been a better time to get MMT Premium! Save $20/year on our subscription by clicking above! Thanks so much for supporting/following MMT and The Eclectic Approach this year! Make sure to tell us at a live course that you're a follower! Hope to meet you in person, or reach out and comment below or on social media! Happy holidays and level up with our sale!